Many events kept me from experimenting with it until recently when I was granted a significant amount of dedicated time to feed my creative desires. The first task was to remove the felt bar so I could exchange a broken needle in the center of the bed for a better one. That went okay but I found the felt had considerable wear on it and is in need of replacing. I will tackle that in time. I believe the machine will work better and have less dropped stitches once that is done. Once I was satisfied that I could actually cast on a garment I chose Infinite Loop designed by Olga Buraya-Kefelian. In my opinion this is the perfect beginning project for the machine knitter because of the beautiful simplicity of the garment. 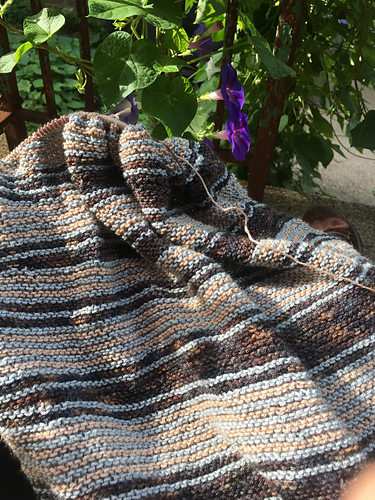 The length and amount of stockinet stitch makes it an excellent candidate for machine knitting in general. I cast on after breakfast and this project consumed me. The first day I dedicated 10 straight hours to it including breaks for lunch and dinner. The machine knitting portion should have been done within this time but I experienced a huge number of dropped stitches. I had to inspect each row before I went on to the next one and make repairs as needed. The garment came off the machine twice when the yarn escaped the holder. I had gotten too far to give up so each time I carefully put the live stitches on a hand knitting needle and picked up the dropped stitches. Perseverance won and I was able to complete the machine knitting and properly take the garment off the machine. I grafted the ends together and picked up and knit the armholes by hand. As my two year old would say “Ta Da!” it is officially done. I love the project and I love what this knitting machine is capable of doing. After I take a long break from it I am sure we will be friends again. I will look into replacing the felt bar and anything else I can do to improve its performance. I look forward to experimenting with unconventional materials like wire. I would like to learn how to do decorative stitches and shaping as well. In time I believe I will be creating interesting pieces that I look forward to sharing with you. Thanks for reading. Until next time; If making things feeds your soul then do everything in your power to spend at least a small amount of time each day making it happen. Previous post: Burgdorf Winery’s 13th Anniversary Celebtation! Thanks for reading my post and thank you especially for commenting on it. I purchased a felt strip to replace what is on the machine. When I do the switch I’ll also update the post. If you are interested in how it works out keep an eye out for the update! I recently purchased one of these machines and I was wondering if you had a copy of the manual for it? Hi Caleb, I did another round of looking and I found this link has a download to a similar machine: http://machineknittingetc.com/brother-knit-automatic-home-knitter-user-manual.html. I bought mine from http://www.knitsewworld.com. It is a little easier to read. If you search on their site for KH35 this page will come up: http://www.knitsewworld.com/Documents/CD_Manual.htm listing the cd version of the manual for $24.95. The printed version is more. I called and ordered my cd over the phone. A Google search will also pull up some videos of the machine in action on YouTube. That is a good place to start.